We have had a lot of questions about Building Door Hours schedules where exterior electronic doors locks are controlled by standard daily schedules. We have constructed a new calendar that tries to give you the necessary information to understand the door hours schedule. The search (Building Door Hours – Symmetry) in 25Live gives you the same data, but hopefully the calendar makes it easier. If there are events outside of the Building Door Hours schedule, then 25Live sends commands to the door groups using the 15 minute offset for exterior doors. Door schedules will change for the Winter Break and will be updated next week. If you have door schedule changes, please e-mail them to LaneEvents@lanecc.edu. 2) The locations in 25Live that are linked to the actual doors in Symmetry are auxiliary locations not normally scheduled in 25Live like hallways, storage rooms or loading docks etc. 3) The primary schedule for Main Campus has a lot of locations associated with it. 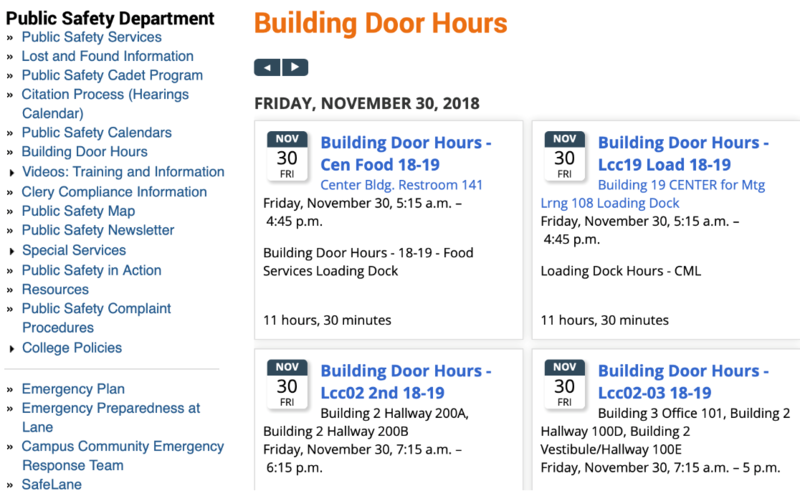 If you do not see an Building Door Hours schedule exception for your building, then it is likely in the primary schedule. The new page lives on the Public Safety Department web page and can be found on the left navigation.